States that have joined the Convention on Cluster Munitions (CCM) should make it clear that in prohibiting assistance, Article 1(1)(c) of the convention prohibits investment in cluster munition producers. All States Parties’ national legislation to implement the convention should include a prohibition on investments in cluster munition producers. Alternatively, for instance when the CCM has already been implemented, a separate law on this issue should be established. This provides clear guidelines for financial institutions and is in the spirit of the CCM. Investing in a cluster munitions producer means supporting the production of weapons that cause unacceptable harm. It runs counter to the norm against the weapon. A growing group of states have made interpretive statements indicating that investments in cluster munitions are banned under the Convention. Investment should be considered banned under the prohibition on assistance in Article 1(1)(c) of the CCM. A growing group of states have made interpretive statements indicating that investments in cluster munitions are or can be seen as banned under the convention. Investing in a cluster munition producer clearly runs counter to the spirit of the CCM and runs counter to states’ obligations under international law. For more information, you could take a look at ‘States Banning Investment’ page. This shows which countries have passed disinvestment legislation and which countries have made statements that indicate they consider investments in cluster munitions to be banned by the CCM. At the time of writing, eleven states in total have adopted legislation that prohibits (various forms of) investments in cluster munitions: Belgium, Ireland, Italy, Liechtenstein, Luxembourg, the Netherlands, New Zealand, Samoa, St. Kitts & Nevis and Switzerland. 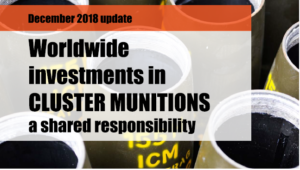 To date, 35 states have expressed the view that investments in cluster munitions are or can be seen as prohibited by the CCM. More details can also be found on the Countries’ best practices page.